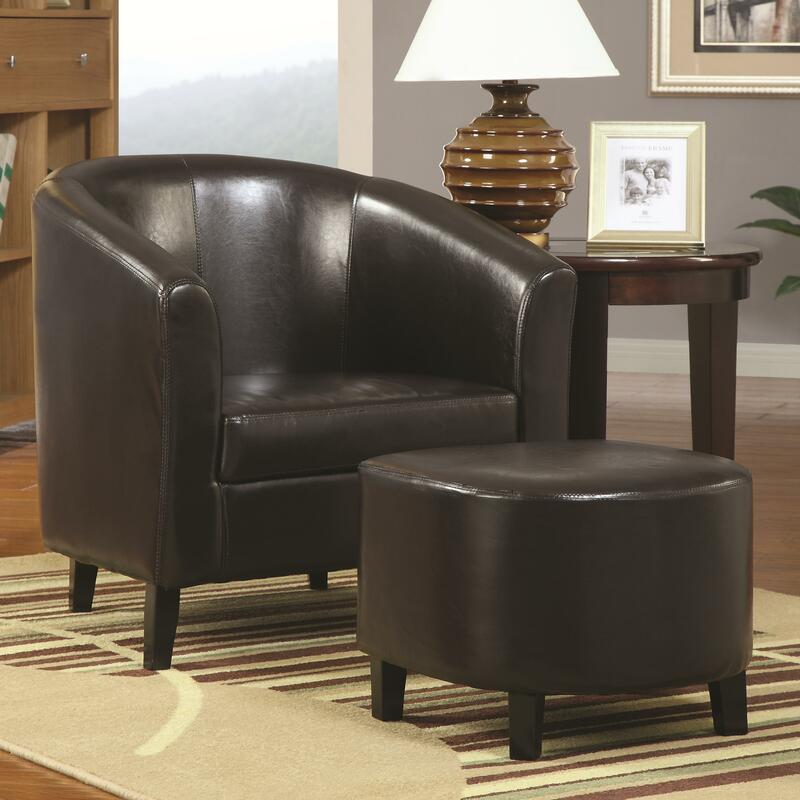 Dress up any living room or bedroom with this barrel back accent chair with ottoman. The dual pieces are wrapped in a dark brown leather-like vinyl. Plus, the soft seat cushion will leave you wanting to snuggle in for hours. Casual, yet, stylish, this chair and ottoman set is sure to make a great addition to your home decor. The Accent Seating Accent Chair w/ Ottoman by Coaster at Al-Mart Furniture in the Oak Park, River Forest, Chicago, Elmwood Park, Forest Park, River Grove, Maywood, Melrose Park, Berwyn, Cicero, North Riverside, Brookfield, Lagrange Park, Franklin Park, Norridge, Oakbrook, Elmhurst, Bensenville, Lyons, Stickney, Harwood Heights, IL area. Product availability may vary. Contact us for the most current availability on this product. The Accent Seating collection is a great option if you are looking for Casual furniture in the Oak Park, River Forest, Chicago, Elmwood Park, Forest Park, River Grove, Maywood, Melrose Park, Berwyn, Cicero, North Riverside, Brookfield, Lagrange Park, Franklin Park, Norridge, Oakbrook, Elmhurst, Bensenville, Lyons, Stickney, Harwood Heights, IL area.